The Papa Meilland Rose is one of the best known fragrant roses, famous both for the flower as well being named by Allain Meilland after his grandfather Antoine. One of the real attractions of Papa Meilland is the fragrance. If you are looking for roses as a symbol of love, red is the best colour, however, an exceptionally fragrant red is even better. 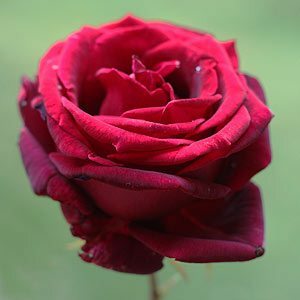 This is a Hybrid Tea Bush Rose and is a strongly perfumed rose with deep red velvety flowers. We love it for fragrance that fills the garden on a warm spring day, as well as the lovely flowers. Papa Meilland is a vigorous grower and will do well in most conditions. Reaching around 1m in height this is an excellent choice for a position where its fragrance can be appreciated. Reliable, repeat flowering and hardy this is a rose that also produces great cut flowers, as the stems are long and straight with single large 14cm blooms blooms. 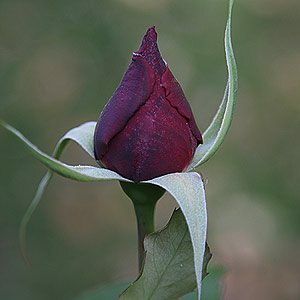 The new buds are attractive being slender and pointed, they open to a wonderful deep crimson red with a velvety petal. This is a rose that will go down in history, it was bred in 1963 and commemorates one of the worlds great rose breeders, it is a great rose with a wonderful fragrance and, in 1988 was rightly was inducted into the Rose Hall of Fame and won the gold medal in many rose shows including the famous Baden-Baden Rose trials. And yes was originally named ‘Meicesar’. If you could find Papa Meilland roses in a florists shop then you would have the ultimate valentines day , birthday or just plain ‘I Love You’ rose. However, as most florists roses are bred for colour and the ‘long lasting’ look, fragrance can be lacking. Charles Mallerin – Deep red and strong fragrance. First select your rose as Papa Meilland is generally available as a bush rose as well as a standard rose. Prepare the soil well before planting by digging in some well rotted compost and aged animal manure, do this a few weeks before planting. We suggest placing a stake in the ground for support before planting the rose. Plant at the same depth as it was in the pot. Back fill and water in well with a liquid seaweed fertilizer. Bare rooted plants need to be planted carefully at a depth they would have been originally. Papa Meilland Rose is a fairly easy rose to grow in Australian conditions, in fact easier than in the UK and much of Europe. Other than some protection from mildew in cooler climates no special treatment is required. Fertilize regularly with a specialist rose food for best results, although we do know a gentleman who has been growing this rose for many years who uses pelletised poultry manure in late winter, masses of flowers.